While decorations and props are important at a Halloween party, the food is probably what guests will care about the most. 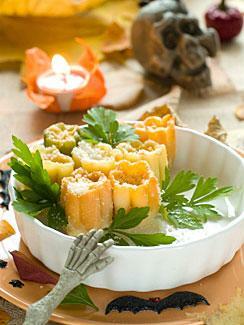 Serve some tasty appetizers at your next Halloween party. 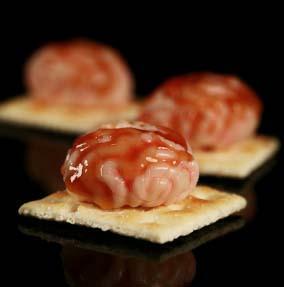 When throwing a Halloween party, be sure to include a variety of food choices for your guests. Of course, Halloween is about scary costumes and spooky decorations, but yummy treats are a big part of the celebration as well. Depending on the type of party you are throwing, appetizers can be the start of a delicious meal or you can throw a party and just serve a variety of appetizers to please your guests. Be as creative as you like with your choices. There are endless possibilities when it comes to appetizers. 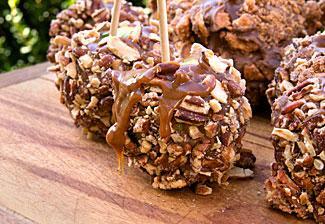 From simple to complex, the following recipes are sure to be a hit at your Halloween bash. Combine cooked shrimp with a little mayonnaise. Drop a rounded mound onto a saltine cracker and top with cocktail sauce. Stuff 24 cherry tomatoes with a mixture of 4 ounces of deviled ham spread and 3 ounces of cream cheese. Top each tomato with a slice of a pimiento-stuffed Spanish olive. Be creative and make a spider web design with sour cream as the top layer of your dip. Add a plastic spider on top as a garnish. Serve with tortilla tips and fresh vegetables. Want to serve up a treat that resembles eyeballs? Try this fun recipe for stuffed olives. Stuff each olive with cream cheese. Arrange olives on a decorative platter then drizzle dressing over the top. Finish with a sprinkle of parsley over each olive. This tasty treat is sure to be enjoyed by guests of all ages. In a large bowl, drizzle melted butter over the popcorn. Next, sprinkle the popcorn with the dressing and toss until all kernels are coated. Serve in a Halloween-themed bowl. First, using an electric mixer, beat the cream cheese in a small bowl on medium speed until you get a creamy consistency. Next, slowly add in the brown sugar and vanilla. Beat all ingredients together until they are well blended. Place mixture in a decorative serving bowl and serve with apple wedges. Tip: To keep apples from browning, lightly toss them in lemon juice. Serve your food in a creative way to add a special touch to the table. For serving dips, hollow out a small pumpkin and serve from it. Plastic spiders make the perfect garnish. Remember: presentation can turn a simple appetizer into something spectacular.